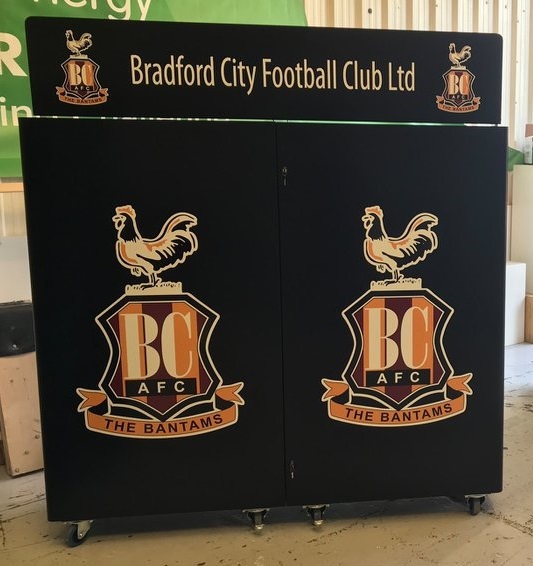 Bradford City Football Club has strengthened its matchday offering with two eye-catching retail display units from Rapid Retail. The fully branded units will provide supporters with easy access to club merchandise, while helping to maximise revenue for the club. Constructed from steel, the wardrobe-style display units are robust yet lightweight. Featuring lockable, fold-out front doors and fitted with castors, they can easily be moved until the optimum selling position is found. Popular with football clubs of all sizes, the display units are a low cost and space-saving solution, which can be designed, built and installed in just 2-3 weeks. Nick Daffern, MD of Rapid Retail, said: “Our wardrobe-style merchandise display units are ideal for any sports ground that has limited space, or a low budget. As well as football clubs, the units are proving popular with tennis, cricket and rugby clubs, as well as zoos and other visitor attractions. Being low cost and high impact, the units are an appealing prospect – especially for those on a tight budget. Rapid Retail is the leading supplier of mobile kiosks and portable units for sports clubs, leisure brands and other sporting venues. Units are available to either rent or buy, with options to suit all budgets. The team works with football clubs based across the UK and Europe, from non-league through to top level clubs. The company’s impressive client list includes Manchester United, Barcelona, Paris SG, Liverpool, Ipswich, and Evesham United. As well as merchandising units, Rapid Retail supplies pop up shops, kiosks and trollies, which can be used for everything from bar and catering units, to shirt printing, ticketing and programme booths and running matchday lotteries. The team also supports clubs with the creation of dedicated fan zones that are growing in popularity among clubs of all sizes, as a way to add value, drive fan engagement and aid the fan experience. For more information and an informal chat about how our units could help you, call us on +44 (0)1386 555044. Sports venue retail solutions – what are your options for maximising revenue? What is a fan zone and why are so many clubs investing in them?